I have just received the newsletter from my postal stamp provider, and it includes a stamp with the mention POSTA PMR (in Cyrillic alphabet), the year 2000, the A facial value (express mail, permanent value)). The stamp shows a waving flag with the three stripes equal in height, and hammer-and-sickle in canton (but no star as would be the case if the flag were the former one of Moldavian SSR). The second stamp of the series has the B facial value (slow mail, permanent value) and shows a "coat of arms" nearly identical to the one of Moldovian SSR, but with RMN on the main ribbon and PMR on the two other ones. The Dniestr Republic was organized by ethnic Russians opposed to being part of newly independent Moldova, particularly in view of the introduction of Moldovan (i.e. Romanian) as the national language. The flag of the Dniestr Republic is identical to that of the old Moldavian SSR. A version without the hammer and sickle is also reportedly in use. I doubt this flag is recognized by the Moldovan government. The Moldovan government does not even recognize the Dniestr government and tried to stop the Dniestr presidential elections of 22 December 1996. It seems, though, that there might be normal relations in the near future. Moldova's newly (December 1996) elected President Petru Lucinschi has said that the Dniestr region might get some kind of "special status". He has also had talks with Russian negotiators and with the Ukrainian president about the Dniestr problem. In Dniestr, Igor Smirnov was re-elected as President and inaugurated on 10 January 1997, when he said "...that the future relationship between Chisinau and Tiraspol should be based on treaties and that Moldova should view the Dniestr region as a [separate] state". Dniestr is still using the Soviet Union car licence plates and they have their own currency - the Transdniestr Rouble. It's not possible to use the Transdniestr Rouble in Moldova nor the Moldovan Lei in Dniestr. Transnistria and Trans-Dniestr are the same. Other name used: Dniestr, Dniester, Dniestria, Trans-Dniester, Trans-Dniestria., Transdniestr, Transdniester, Transdniestria. On their banknotes the "Transdniestrian Bank" is in 3 languages, all in Cyrillic. A flag was adopted officially on 25 July 2000 (but before several variants were in use). On the same day a coat of arms was adopted. The flag is 1:2, three horizontal stripes 3:2:3 of red, green, red. In the canton there is an imaginary square; in the square (size 1/5 of the width of the flag) is the hammer and sickle in yellow and red star bordered yellow. The star is in an imaginary square (size 1/10 of the width and situated 1/10 of the width of the flag). The reverse of the flag shows only three horizontal stripes of red, green, red (3:2:3). The Presidential flag is like the national but without hammer and sickle and proportioned 1:1 (fringed yellow). In the center are the new national arms (very similar to the old ones except for some changes in inscriptions). The Army flag is blue with red cross fimbriated yellow (red more yellow is approximately one-half of the height). "In the left bank of the Dniestr Moldavia (Camenca, Ribnita, Dubosari, Grigoriopol, Slobozia, Tiraspol districts and towns) there lived 601,800 inhabitants (1989 census). 39.9% Rumanian, 28.3% Ukrainian, 25.5% Russian. And on the right bank Tighina or Bender has got a large Ukrainian and Russian majority (18.2% and 41.9%). These districts will contain the seceded Transnistrian Rep."
If we see from Chisinau the "Transnistrian Rep" is really over the Dniester. But if we see from Tiraspol the republic is before Dniestr. Citizens of this republic name themselves as "Near-Dniestr Republic" (Pridnestrovskaya Respublika). 'near-' but not 'trans-'. I think a more correct translation is Dniestr Republic (or Nistru Republic). On 30 April, 1990 the town councils of Tiraspol and Bendery decide not to use the new Moldovan flag (adopted 27 April). They decided to use the flag of USSR instead of the Moldovan flag. It was the start of bloody "flag wars" in the Dniestr region. According to the SAVA 10th anniversary special issued in Dec 2000, the Transdniestrian Moldovian Republic declared its independence from Moldova on 2 September 1990 and a Constitution was adopted by referendum on 24 December 1995 and signed by the President of the Transdnistrian Moldavian Republic on 17 January 1996 and Arms and flag were most recently established by Law on 3 July 2000. According to "Courrier International" (#645, 13 March 2003), quoting the Moldovan newspaper "Flux", a project of new Constitution is pending in Moldova. The new Constitution should proclaim a federal state and should be elaborated with the contribution of the Transnistrian administration for the status of the Transnistrian Republic). A referendum should be organized both in Moldova and Transnistria, not later than the 1 February 2004. Presidential and legislative elections should then take place, not later than the 25 February 2005. The Moldovan authorities have forwarded to Transnistria the principles to be included in the new Constitution. In the future federal state, Russian shall be an official language. Moreover, Transnistria shall retain all its national symbols until a common symbolic is established. At the homepage of the Constitutional Court of the breakaway Dniester Republic ( http://www.kspmr.idknet.com/eng/photoarch.php ) I see an unidentified flag in the first picture. Seems like the Dniestr flag with a coat of arms in the centre. Could this be the Court's flag? Anyone knows? Yes. It is the official presidential standard. At the President's site (http://www.president-pmr.org/ ) there is also a flag with the coat of arms in the centre. I suppose this is the President's Flag. Under /english/republic/national symbols the national flag is presented. Here without the hammer and sickle. At the above Constitutional Court site, there are a few pictures with the hammer & sickle flag. Seems like they are both used. The president flag of Transnistria, officially Pridnestrovskaya Moldavskaya Respublika (PMR), adopted on July, 18 2000. It replaced an earlier flag, adopted in 1997. The unrecognized breakaway state of Transnistria apparently has a small air force. 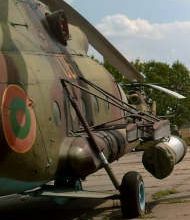 I have found a picture of an Mi-8 helicopter bearing their roundel, in the colors of the regime's flag. At the homepage of the State Customs Committee of Dniestr Republic you can see the customs flag of the Dniestr Republic (Moldova). There is also a good picture of the customs arms at the site. On this page identified by Christian (here), the "national" flag of Transdniestria is shown side-by-side with the Customs flag and the shade of green of the latter is noticeably darker (same shade of red, though.) This darker green agrees with the Soviet tradition, so alive in all flags Transdniestrian: The national flag, adopted from the Moldavian SSR flag with regular green (see our page on USSR flag colours) while the Soviet customs flags were dark, "KGB green"
I stumbled upon a new law establishing specifications for the current flag and the adoption of a service pennant. On March 3rd, 2018, the Customs Service announced Presidential Decree No. 78 of 2018 establishing the heraldic signs and banners of the service. The law, which can be seen at http://customs.gospmr.org/geraldika-gtk-utverzhdena-ukazom-pre.html, establishes the previously reported flag as the current banner with the addition of specifications. The red sections take up 1/10th of the hoist area, the small green takes 1/18th of the hoist area and is placed in between the two red sections (forming the PMR flag). There is no size specification for the customs badge and the overall flag ratio is 1x2.11 (900*1900 mm). and other vessels of the service, is 1:5. Flag proportions 2:3. The Moldovan flag in canton is 4/9 hoist height; the stripes are equal. At first glance it may look like the hammer and sickle are alone, but the star seems to be there, barely visible hidden behind the cravattes, of which there are three: two red and one green, each with a gold border enclosing some (different, I think) gold text and - in a square box - the state arms. I have represented the text with ЖЕНЕРАЛЕ РЕПУБЛИЧИЙ МОЛДОВЕНЕШТЬ НИСТРЕНЕ, "Constitutional Court of Dniestrian Moldovan Republic." Mikhail Revnivstsev of RussoVex reports an upcoming change of the flag of this "rebel" republic. The Parliament there is considering the new symbols of the republic as proposed by the party "Obnovlienye" - "Renewal" and several other civic associations. The party is led by the speaker of the Parliament, Mr. (or "Comrade") Evgeniy Shevtchuk, which adds a lot more power to the proposal. The new flag would be a Russian tricolor of white, blue and red. There would be some device added to specifically represent Pridniestrovye. The work on the shape of this device would be trusted to the local heraldists. As Mikhail points out, the new flag is going to be similar to the Slovakian and Slovenian ones, not so much to the Russian one. Many will miss the last hammer and sickle disposed to the vexillological museum, I'm sure. My assumption that hammer and sickle flag of this quasi-state will be tossed to the dustbin of history was wrong. It will stay as the "state" flag of PMR while the new "national" flag would be a Russian tricolor in the ratio of 1:2 (like the original "Yeltsin's" flag of RF of 1991) without any adornments. Both flags would be flown from the government buildings. Gleb Kalashnikov, heraldic adviser to the President of RF, calls the decision of the Supreme Soviet of PMR an "ill-conceived" one and, possibly, illegal. But he also notes it couldn't be prohibited. 96 % of the "citizens" of that "republic" voted for incorporation into RF, although nobody has a clear idea how to go around to achieve it - some are giving an example of the enclave of Kaliningrad as a proof it can be done, others are advocating an annexation of the Ukraine to Russia in the near future, and, then, it wouldn't be any problems with the "glorious re-unification". Tiaspol. Draft bill for a new national flag was filed Wednesday at the Supreme Council of Pridnestrovian Moldavian Republic, Voice of Russia announced, as citing Moldavian Kimmersant daily. Besides the three horizontal bands of red, green and red with a hammer and sickle in the canton the draft bill provides for another flag - the Russian flag with an emblem in the corner. The new flag aims at consolidation of the people of the Republic in the name of the integration with Russia. Among the authors of the draft bill there is Pridnestrovian leader Evgeniy Shevchuk. The colors and proportions on the new flag will be the same as on the Russian flag, but there will be an emblem in the corner. The new flag will be used alongside with the national flag of the Republic. During the Dnistrian revolt (1990-1992) some revolutionary flags were used. General Suvorov's was one of the most known and published. Now, we can have a correct image from a photo taken by Michel Lupant. Ratio seems to be 7:11. The diagonal stripe is the river (with waves meaning water) and the central figure is the statue of general Suvorov, a local hero.